Ham and cheese is a very good combination, as I like to have a cheese on my bread so put it inside is not a bad option. I use the basic recipe from...................... (yes, this is the one that I forgot to take picture, Mikasan is very good at making bread when Takakosan is well known from her sweet), the recipe for rich bread is very easy to knead and easy to handle. You can use this base recipe to make many kinds of bread up to your desire, I got this idea when I see she make apple ring bread. Put the flour and yeast in a bowl, whisk to combine, add the sugar and salt whisk again. Pour the milk mixture into the bowl, use large spoon to mix everything together. Put the butter in the bowl and rub until all butter is distributed, and knead briefly to bring all the ingredients together. Take the dough out of the bowl and knead, until the dough is soft, smooth and elastic about 10 minutes. Preheat the oven to 180°C. Take the dough out of the bowl. Gently press down the dough and a rolling pin to roll the dough to press the dough into a rectangle, about 25x25 cm. 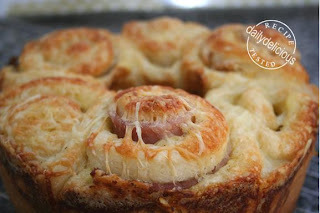 Brush the mayonnaise over the dough then scatter cheddar cheese all over and place the ham on top. Roll the dough toward you starting at the top, gently pressing as you go to form a tight log. Cut the dough into 6 pieces, then place the dough, cut side down in the prepared pan. Scatter Gruyère cheese all over the top.Let the dough rise until almost double in size. Hi is the texture of the bread soft? And how long does it keep at room temperature? Also, you have another recipe for ham and cheese bread in your site. Which one do you prefer? Baking the ham and cheese bread now. May I link you please? I like the texture of this bread, it's still soft when we ate it for breakfast this morning. I've posted a pic in my blog. Not a beautiful bread but definitely tasty. BTW, I don't know why but I can't link you to my blog. It shows a different url.. Thanks for sharing the recipe & the step-by-step guide, it made a lot easier way for us (the beginer) to learn. Anyway, I tried it and love the bread. Yours definitely look way better than mine! Love your blog !I made this bread today.It was soft and delicious!. Thank you for posting this recipe.